to the political conventions, you’ve come to YouTube to get informed on the U.S. election. In fact, over the past few weeks you spent over 20 million hours watching - and rewatching - the presidential debate live streams on YouTube. That’s the equivalent of over 2,288 years of time! With just over a week until election day, all eyes are on the candidates as they work to earn your vote. As in 2012, YouTube is back live streaming election results coverage and this year, you can choose from more news organizations than ever before. Also, tune in to a special election night event at YouTube Space NY, where host Complex News will deliver live results coverage and celebrate the momentous occasion. If you haven’t already sent in your ballot, head to Google, search “how to vote” and get all the info you need to make your voice heard. From candidates announcing their run for office to the political conventions, you’ve come to YouTube to get informed on the U.S. election. program back in September, an initiative dedicated to amplifying the voices of YouTube role models who are tackling division and hate by creating videos that share stories of hope, connection and understanding. Today we’re introducing our latest initiative in this program: a new partnership with StoryCorps, the national nonprofit organization dedicated to recording and archiving oral stories from all Americans. Through this new collaboration, we’re teaming up with StoryCorps to help start a national conversation about identity and belonging in America, beginning with a production program at the YouTube Spaces in L.A. and N.Y. in December. At these Spaces, we will create custom-built sets that look and feel like the iconic StoryCorps recording booths where participating creators will help extend StoryCorps recordings to video. These creators will be able to come in with a friend, loved one or person they respect to talk about their experiences in our country as it stands today - both the good and bad. As part of YouTube Creators for Change, we’re also proud to support the StoryCorps' campaign #WhoWeAre, created in partnership with Upworthy. The #WhoWeAre series features animated stories of everyday Americans selected from the StoryCorps archive that help us remember our best selves. We hope these conversations will inspire people around the country to reflect and share their own personal stories about who they are and who they want to be. We’re thrilled to be working with StoryCorps on bringing their approach to listening and recognizing our shared humanity to video, and can’t wait to share more on our work together in the coming months. Juniper Downs, Head of Public Policy for YouTube, recently watched #WhoWeAre. Diversity is our nation’s strength, yet in America today, we are seeing new levels of fear and misunderstanding. It’s never been more important to sit down and listen to each other -- hear each other’s stories, learn about what it’s like to walk in someone else’s shoes, and remember what makes us unique and what we all have in common. That’s why we launched our YouTube Creators for Change program back in September, an initiative dedicated to amplifying the voices of YouTube role models who are tackling division and hate by creating videos that share stories of hope, connection and understanding. Today we’re introducing our latest initiative in this program: a new partnership with StoryCorps, the national nonprofit organization dedicated to recording and archiving oral stories from all Americans. Elections-related YouTube searches are also at an all-time high. Searches for U.S. election content are up 547 percent compared to this time in the last presidential race. Throughout the debates, millions of viewers tuned in and stayed engaged. The average live session duration was 22 minutes across all three presidential debates and concurrent viewership consistently peaked towards the end of the debate. With only 18 days until U.S. Election Day voters are preparing to head to the polls. If the voter registration deadline in your state hasn’t passed, register today! It only takes 1 min., 34 seconds. This year, more news organizations live streamed the U.S. presidential debates on YouTube than ever before, and we saw record-breaking interest from the YouTube community. The 2016 presidential debates rank as the three most-viewed political live streams of all time. In total, these debates drove 8.5M live watch hours and averaged 1.7M live peak concurrent viewers. You can also join The Young Turks and Complex News on the ground reporting from Las Vegas, Nev., using YouTube Live directly from their phones. Can’t decide on one stream? Check out youtube.com/news to follow all of the coverage. And if the voter registration deadline in your state hasn’t passed, register today! It only takes 1 min., 34 seconds. With just 21 days remaining, the U.S. presidential election is top of mind for voters across the country. Over the past three debates you’ve come to YouTube to follow live coverage from more news organizations than ever before. And Wednesday’s third and final presidential debate will be no exception. with the goal of helping creators earn advertising revenue while connecting their innovative content to audiences around the world. Every year, more and more brands are making YouTube essential to their marketing strategy. In fact, in the last year alone, the top 100 advertisers have increased their spend on YouTube video ads by 50 percent. As brands continue to embrace the value of YouTube, they’re also taking their investments one step further, partnering with creators on branded content opportunities such as product placements, promotions and sponsorships. As we look to the future, we want even more creators and brands to come together and realize the benefits of these creative collaborations. Today, we’re excited to announce that Google has acquired FameBit -- a technology platform company that helps creators and brands find and work with each other through sponsorships and paid promotion. We believe that Google’s relationship with brands and YouTube’s partnerships with creators, combined with FameBit’s technology and expertise, will help increase the number of branded content opportunities available, bringing even more revenue into the online video community. Creators will always have the choice in how they work with brands, and there are many great companies who provide this service today. This acquisition doesn’t change that. Our hope is that FameBit’s democratized marketplace will allow creators of all sizes to directly connect with brands, as well as provide a great technology solution for companies like MCNs and agencies to find matches for their creators and brand partners. We look forward to seeing FameBit and the entire branded content space thrive as we continue to support the success and creativity of the creator community. Ariel Bardin, Vice President, Product Management recently watched "New Yorkers Share their Story for a Dollar." Nine years ago, YouTube launched its Partner Program with the goal of helping creators earn advertising revenue while connecting their innovative content to audiences around the world. Every year, more and more brands are making YouTube essential to their marketing strategy. In fact, in the last year alone, the top 100 advertisers have increased their spend on YouTube video ads by 50 percent. and Saturday Night Live’s Donald Trump vs. Hillary Clinton Debate Cold Open. The final presidential debate is next Wednesday, Oct. 19, and we’ll bring you all the action live on YouTube from Las Vegas, Nev.
Brandon Feldman, YouTube News & Politics, recently watched the second presidential debate. Sunday’s highly-anticipated debate between Hillary Clinton and Donald Trump drew new levels of interest from the YouTube community. 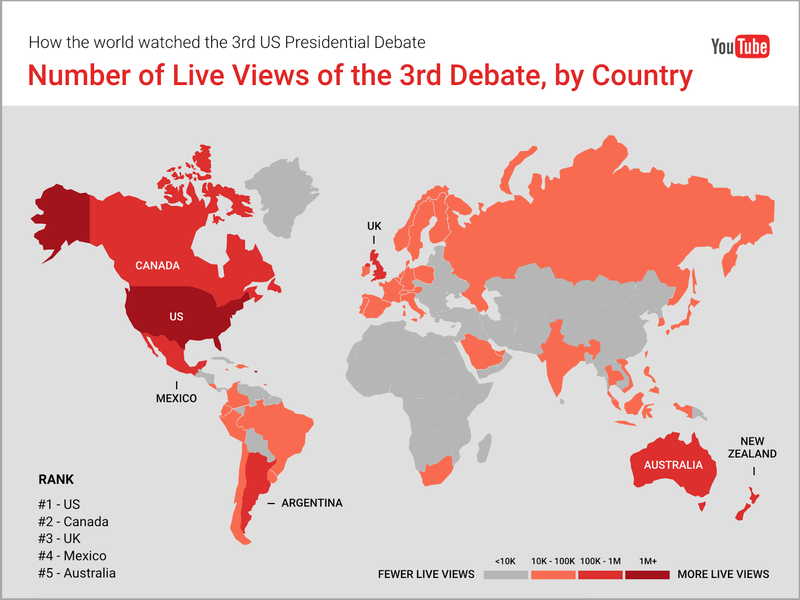 The closely watched live debate and on-demand videos surrounding it generated over 124M views since Sunday, representing a 40 percent increase compared to the first presidential debate, which drove 88M views. Of course many viewers came to YouTube to watch the debate live and we saw over 1.5M peak concurrent viewers, five times higher than the second presidential debate in 2012, and over 2.5M live watch hours, nearly six times higher than 2012. Those viewers were highly engaged as well. On average, they watched the debate for nearly 25 minutes. And they came from all over the globe. After the U.S., top countries by viewership were: Canada, Mexico, Australia, Great Britain and Vietnam. While much of the attention was on the debate, commentary continues to be a hot topic on YouTube. Sketches from some of the most popular late night shows were amongst the weekend’s most-viewed videos leading up to the debate. If you’re looking for a laugh after Sunday’s heated debate, check out Jimmy Fallon’s Trump calls Madea and Saturday Night Live’s Donald Trump vs. Hillary Clinton Debate Cold Open. Stay up to speed on U.S. election news, including live coverage, by heading to youtube.com/news. And if you haven’t already, register to vote. It only takes 1 min, 34 seconds! As U.S. voters prepare to head to the polls in just over a month, all eyes are on Hillary Clinton and Donald Trump as they debate for a second time -- and like the last two debates, you can head to YouTube to watch the candidates take the stage. , Americans are gearing up to hear from the vice presidential nominees in the only debate where they’ll face off -- and you’ll be able to follow all the action live on YouTube! As always, check out youtube.com/news to follow all of the live coverage. See you tonight, and from the upcoming presidential debates in St. Louis, Mo., and Las Vegas, Nev.
Brandon Feldman, YouTube News and Politics, recently watched "The First Presidential Debate." After last week’s record-breaking presidential debate, Americans are gearing up to hear from the vice presidential nominees in the only debate where they’ll face off -- and you’ll be able to follow all the action live on YouTube! and Google Home, you can fill your home with more songs, more versions, and more dance parties. Google Home, a voice-activated speaker powered by the Google Assistant, is available for pre-order today. And it comes with a free 6-month YouTube Red membership, making it the best way to listen to music from YouTube at home. In addition to being able to access all of YouTube’s music on Google Home, with YouTube Red you’ll be able to enjoy ad-free videos and more, almost anywhere you’re signed in to YouTube. You’ll also get access to all-new original movies and series from top creators made specifically for YouTube Red members. Pre-order your Google Home with 6 free months of YouTube Red today. This offer’s only available for a limited time (for new members only), and we’d hate for you to miss out. Sarah Ali, YouTube Living Room Group Product Lead, recently watched "Alicia Keys - In Common." Matthew Leske, YouTube Red Group Product Lead, recently watched "Kygo - Firestone ft. Conrad Sewell." YouTube is where music lovers dig deep for music videos, live performances, and new songs that move them. YouTube Red makes music on YouTube even better, letting you play songs ad free, in the background, offline, and more. Now with YouTube Red and Google Home, you can fill your home with more songs, more versions, and more dance parties. Google Home, a voice-activated speaker powered by the Google Assistant, is available for pre-order today. And it comes with a free 6-month YouTube Red membership, making it the best way to listen to music from YouTube at home.